So our friends and family back east—especially in Kentucky—are experiencing one of the toughest winters on record. Even now, there is snow on top of ice on top of snow. Out here in California, we are experiencing a drought, although we got a few sprinkles overnight (and snow in the mountains). And, so far, the drought has not caused a famine in the land. Imagine if it had. Imagine a drought so bad that it caused a famine in which food became scarce and lives were being lost (like the 2011 drought—and famine—suffered in the Horn of Africa, from which thousands died, and 90,000 kids are still in danger). In a situation like that, would a Christian be obligated to share food with others? If not obligated, then wouldn’t the Christian at least want to share food with others to keep them alive? In its context, this verse is speaking of caring for widows in your own family. Don’t have the church (or the government!) provide for your widowed mother, grandmother, or aunt—take care of her yourself because you are her family. If you don’t take care of the need in your own family, then you don’t understand the faith. This idea of taking care of family first is found throughout Scripture and throughout the New Testament. In fact, it is such a basic notion that to fail in this regard would be not just falling below the gospel standard of morality—but below even the standard recognized by the pagan culture. Everyone knows that family comes first. “So then, while we have opportunity, let us do good to all people, and especially to those who are of the household of the faith” (Galatians 6:10). Returning to our hypothetical drought and famine, we can think of the matter this way. If we were living through a famine, we would naturally feed ourselves and our own families first. It would be neither heroic nor laudable to feed our neighbors’ kids, while allowing our own to starve. Each father must provide for his own. 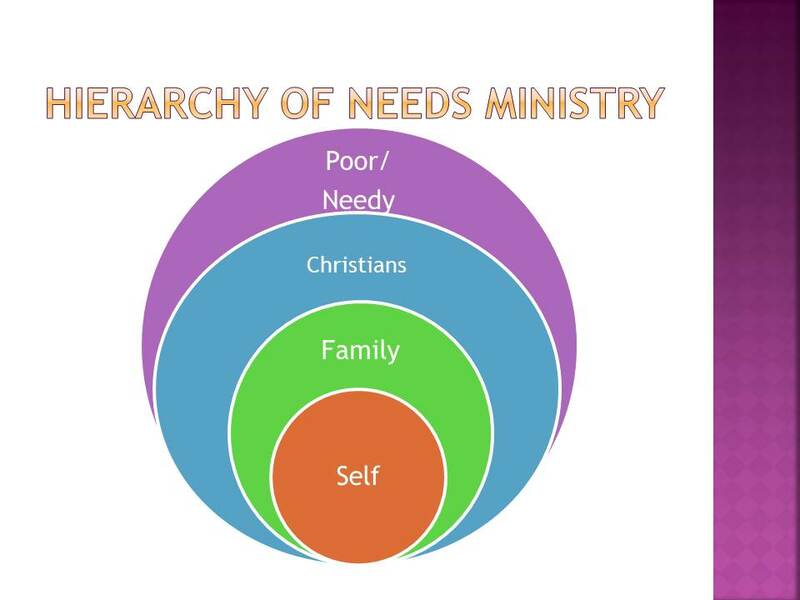 In Galatians 6:10, Paul is not intending to drive a wedge between serving the needy church and serving the needy pagans. The command is “do good to all.” So, there is no diminishing of social justice, feeding the poor, or loving our neighbor. Yet, there would be something terribly dysfunctional if we were to concentrate our care on those outside the faith, while we left our own faith family to starve, suffer, and die. The world will not be sure that you are Jesus followers if you simply love the poor and feed the needy. Jesus made this point plainly for His disciples in John 13:35: “By this,” Jesus says, “all men will know that you are my disciples, that you love one another.” The need hierarchy of the New Testament demands that we take care of our brothers and sisters suffering on account of Christ. Loving one another will itself witness to the world that we are Christians. As Tom Schreiner writes in his commentary on Galatians: “A hierarchy is established, so that a priority is assigned to those who are fellow believers.” Our persecuted brothers and sisters around the world are fellow believers. How do we make them our priority? This entry was posted in Good Theology, Pastoral Issues, Persecution and tagged Christian Persecution, ministry, needy, poor, social justice. Bookmark the permalink. ← Why Are Christians Neglecting Persecution Studies? Too many forget we are a family in Christ. Thank you for sharing your insightful posts and your burden for the persecuted. I have been working on an important project using scripture. Yesterday while going over it, I felt something was missing. Galatians 6:10 is the missing verse! Thank you, God is Good!